"For this Provost and likely for those who preceded me, Shawn Kilat has been ‘the rock’”, says Jeri Echeverria, Interim Provost. “Her voice is respected and appreciated by all of us in Academic Affairs - whether in dealing with the Deans' Offices, the faculty, or members of the Provost’s Team, Shawn has been consistent in her excellent service to others. She is authentic, hard working and effective -- not to mention being a delightful colleague. She will be sorely missed and we wish her the best in her well-earned retirement." After retirement Shawn pledges not to over commit herself, at least not right off the bat! She’s looking forward to more time with family and friends, and plans to definitely add more hiking, gardening, reading and cooking to her life… not to mention the few “projects” around the house that have been waiting for this moment. 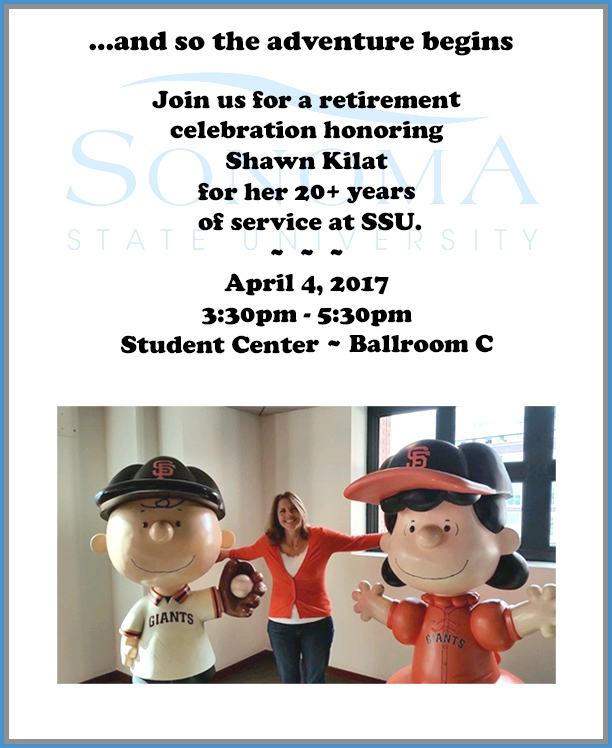 Join Shawn’s friends, family and colleagues on Tuesday, April 4 from 3:30 p.m. – 5:30 p.m. in Ballroom C as they honor and celebrate her years at SSU.